Great Britain’s rise to power occurred in large part due to the industrial revolution and the efficient, modern design of sailing ships in the 1800’s. This allowed the kingdom to establish it’s globe spanning empire of colonies and territories, such that the sun, truly never set on the British Empire. One of the key inventions that was instrumental in helping to establish the British Empire, was the creation of a uniform postal system by Sir Rowland Hill and the issuance of the first postage stamp in 1840. 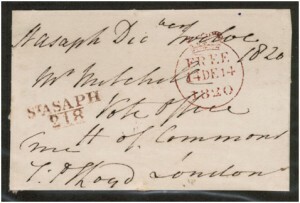 The importance of this event is due to the fact that, by establishing an efficient postal service within Great Britain and the Empire, a strong and highly competitive British system of commerce, rapidly spread throughout the British Empire and generally was able to overwhelm many of it’s foreign competitors as well as local industries. The British postal system was much copied and thus became the foundation for many of the more efficient postal systems operating within the world today. Historically, the Royal Mail was created by Henry VIII in 1516. Thomas Witherings was declared chief postmaster by Charles I and the Royal Mail became available to the public. In 1661 Henry Bishop became the first Postmaster General during the reign of Charles II. Delivery problems caused customers to complain about delayed letters and in response thereto Henry Bishop introduced the Bishop Mark. It’s design is a small circle with the month and day printed inside, and was probably the first known postmark. This mark was applied in London at the General Post office and was soon adopted by both Scotland and Ireland. The postal system quickly became larger, expanding from six roads to a network which soon covered the entire country. Post Offices became common in most towns, each of which was given its own postmark. 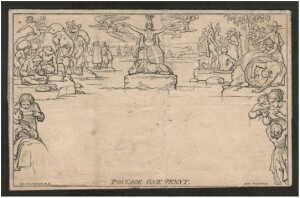 In 1680 the London Penny Post was conceived. This was a mail delivery system which would deliver both letters and parcels for the sum of one penny. 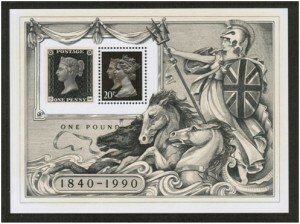 On May 6th 1840 the Penny Black UK Postage stamp became the first postage stamp issue of the world. It is a small, square stamp depicting Queen Victoria looking to the left with fancy engraved borders and background but no perforations. It quickly became apparent that black was not a good choice of color for a stamp since the cancellation mark could not be easily seen and thus the Penny Red, (a brick-red color,) was issued from 1841 and was in use for many years to follow. The Penny Black stamp is sought after by most collectors of Great Britain stamps and even though it is relatively easy to find in used condition, it still commands a high price. The Victorians were known for their experimentation (remember.. it is the peak of the industrial revolution) and because of the relative inaccuracy and slowness of using scissors to cut single postage stamps from their sheets, the Archer Roulette system, (rouletting,) became popular, quickly followed by experimentation in the use of perforations. This lead to perforations to separate UK stamps becoming standard practice by 1854. Difficult to find issues include the various ‘green plates,’ including the 1855 1 shilling deep green overprinted; the 1862 1 shilling green plate 1, and the green abnormal plate 3 from the same year. Nevertheless, the persistent collector can find these issues and then it becomes a question of individual affordability. 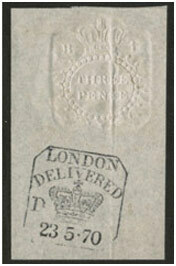 From the 1840 Penny Black into the year 1902, British postage stamps only showed Queen Victoria (QV). In 1902 the four kings era began with King Edward VII (KEVII) ascending the British throne. His image was depicted on a set of new stamps used until 1911. These were followed by stamps depicting King George V (KGV) from 1911 until 1936. Very briefly in 1936 a set of stamps was issued depicting King Edward VIII (KEVIII) but with his abdication in favor of King George VI (KGVI) these stamps were quickly replaced with a new issue of postage stamps showing King George VI. The KGVI stamps were issued until 1952 and upon the death of King George VI, Queen Elizabeth II (QEII) came to power and stamps bearing her likeness are still in use 61 years later. Even though a few commemorative stamp sets were issued during the four kings era, British postage stamps , especially commemorative issues, did not become commonplace until the 1960’s. British stamps are now very colorful and cover topics ranging from art and history to technology and of course ships. 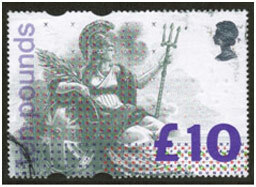 In 1993 the Royal Mail issued a £10 stamp depicting Britannia and with Braille like embossing. From 1967 to 2013 the British Machin set has grown to over 400 different and distinct issues, making it the longest set of stamps ever issued by a nation. The Royal Mail added Regional issues to it’s postage stamp mix in 1958, with stamps for Northern Ireland, Scotland, Wales & Monmouthshire plus starting in 2001 England. The regional issues for Guernsey, Jersey and Isle of Man have now broken away into their own issues as part of the British Commonwealth. Finally, the true collector of British postage stamps will want to include in their collection issues of semi-postal stamps, postage due stamps, official stamps, booklet panes and entire booklets plus the numerous British Offices Abroad issues ranging from Middle East Forces and Eritrea to Morocco and the Turkish Empire. The British Empire comprised of about 80 postage stamp issuing colonies, territories and protectorates changed to a smaller but important global economic organization called the (British) Commonwealth of Nations. These nations have had joint, common design issues from time to time, which are called omnibus issues. These omnibus issues include the 1935 King George V Silver Jubilee issue, the 1937 King George VI Coronation issue, the 1945 Peace issue, the 1949 UPU issue, the 1953 Queen Elizabeth II Coronation issue and many more. Most of these nations, many of which are remote islands in the Atlantic, Pacific and Indian Oceans, however, issue there own stamps which often very colorfully depict aspects of their cultures, economies and environments. There are numerous such stamp issuing countries among the islands of the Caribbean including but not limited the Saints of Helena, Kitts, Lucia, Nevis and Vincent.